As practitioners of complexity visualization and thinking, we simply look at complex environments differently. What we do is make the invisible visual — we help reveal through imagery the unique properties of Complex Adaptive Systems (CAS), the parts, the whole and the greater whole, so our clients can see where they fit into their systems. 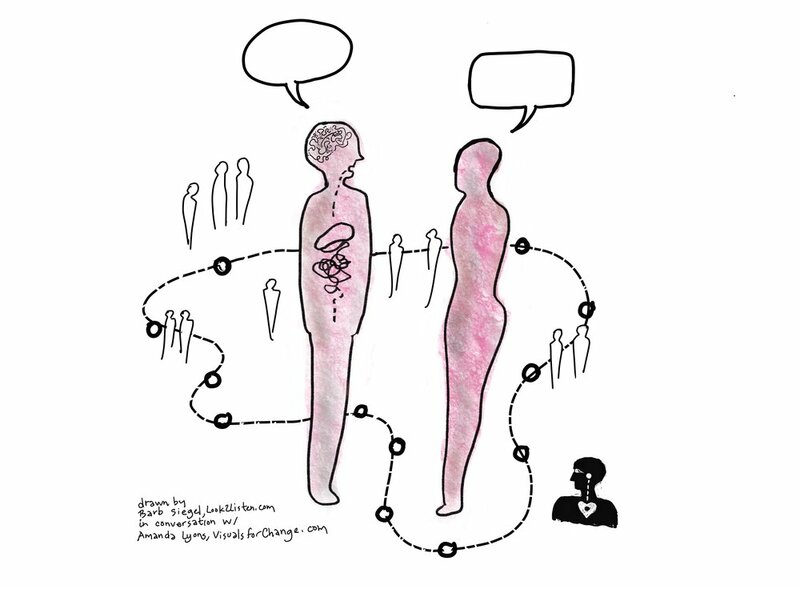 Plexus Catalysts and Visual Facilitators Barb Siegel and Amanda Lyons are creating a catalog of visual prompts and tools for conversations around applying complexity science to human systems. We draw out what it feels like to be in a system – literally. While our styles and outputs are different, we both believe that understanding complexity science concepts and applying them differentiates our work. Newer PostHow Would You Design a Template for a Visual Facilitation Session?